India is gaining recognition as one of the fastest growing markets for advanced energy storage technologies around the globe. There are opportunities for stationary energy storage to help improve power quality & reliability as well as to help integrate renewable energy sources. It is expected that in the next 3-5 years, Indian’s EV market will also witness exponential growth. India Energy Storage Alliance (IESA) estimates that Indian market would grow to over 300 GWh during 2019-2025 considering ESS and EV opportunities. India is expected to attract over $3Billion in investments to support 3+ Giga factories for Li-ion batteries and also witnessing additional investment for alternate energy storage technologies. IESA has set a vision to make India a global Hub for R&D and manufacturing of advanced energy storage and EV systems by 2022. We are excited about the recently launched National Mission for Transformative Mobility with Phased Manufacturing Program for Li-ion battery manufacturing by NITI Aayog. Ministry of Heavy Industries has launched FAME -2 (Faster Adoption and Manufacturing of Electric Vehicles) incentives with a budget of $15 Billion. Ministry of New and Renewable Energy is also planning to launch National Energy Storage Mission later this year with a focus on domestic manufacturing for all types of energy storage technologies including advanced lead acid, thermal storage, and ultra-capacitors apart from Li-ion batteries. Ministry of Science and Technology is also keen to accelerate domestic R&D capabilities to support this growing industry through Mission Innovation. IESA’s efforts toward promoting battery storage and electric vehicles adoption in India have shown encouraging results, and now we are looking to build mutually beneficial associations between the US and India toward clean renewable energy usage. The IESA Indo – US Emerging Tech Partnership Drive is organized to strengthen the existing Indo-US ties and to create awareness about the recent developments in the policy and market. Dr. Rahul Walawalkar, Founder and President of IESA and Netra Walawalkar, Director, Strategic Relationships, IESA will embark on a 6-week journey covering 20+ cities that host some of the R&D facilities and startup ecosystems across the US. 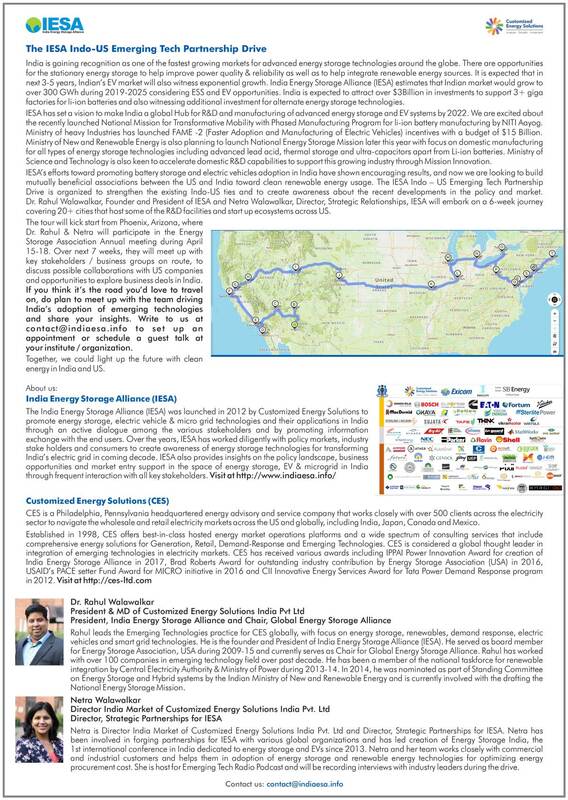 The tour will kick start from Phoenix, Arizona, where Dr. Rahul & Netra will participate in the Energy Storage Association Annual meeting during April 15-18. Over the next 7 weeks, they will meet up with key stakeholders/business groups on the route, to discuss possible collaborations with US companies and opportunities to explore business deals in India. If you think it’s the road you’d love to travel on, do plan to meet up with the team driving India’s adoption of emerging technologies and share your insights. Write to us at contact@indiaesa.info to set up an appointment or schedule a guest talk at your institute/organization. Together, we could light up the future with clean energy in India and US.